Since a couple of people commented on my last post that they liked the idea of having wider sleeves/cuffs on the baby kimonos, I thought I'd share two different ways I've achieved that. 1) I knit the "straight" part of the sleeves (where you've finished increasing out to the length of the cuff and are working on the part that will actually become the cuff width) to 6" wide instead of 4". This means the cuff ends will be 3" wide when finished instead of only 2", which seems to me to give the baby a lot more room to grow. It also means the v-neck is less deep and the overlap is a lot wider than with the narrower cuffs, so again the baby can get chubbier without suddenly finding the v-neck at its navel and nothing covering its little chest. 2) Don't seam up the underarms of the kimono all the way down to the ends of the cuffs. 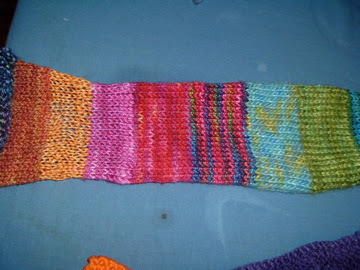 Leave about the last inch or two unseamed, so the cuff can "expand" as necessary for the little hand. It looks cute folded back this way, too. 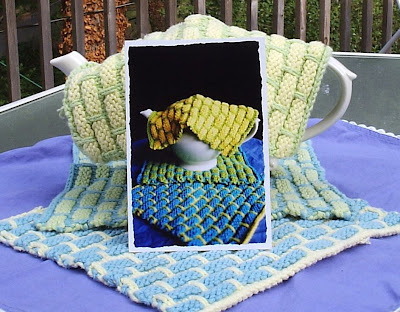 If you're concerned that the cuff might be too short to be folded back, you can always add a knitted or crocheted border. 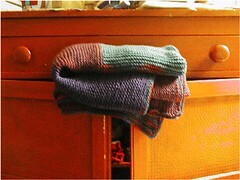 ... and this is probably misnamed as a swatch... but when stashhunting for the blanket this morning I came across this long-abandoned log cabin (great colours, but terrible-to-work-with vintage acrylic yarn that kept breaking). I'm going to find a way to incorporate it, maybe chopping it into pieces. Stay tuned... this may well be the mother of all log cabins at the rate it's going! After four months, I finally finished the Moderne Baby Blanket. 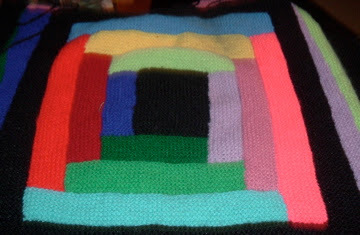 The border didn't take me long to knit but sewing the ends took quite a bit of time. I used Lorna's Laces Shepherd Worsted in Ravenswood, Violet, Douglas Fir, Cranberry and Blackberry with size 9 needles. I knew it would be a bit larger than the one in the book but I had no idea that that finished size would be 45 inches by 49 inches. No wonder those last several blocks seemed to take forever. 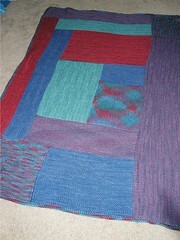 I made a few minor adjustments to the pattern for blanket just to try to make it a bit more interesting. Overall, I'm very pleased with the blanket and can't wait to hear from the mother and baby I'm sending it to. 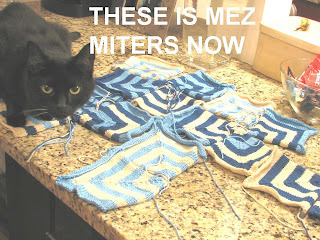 Knitting . I'm trying to figure out what to do with the "wavy"
sides of the bib. Any suggestions? These are some warshcloths I made last year. The picture in front is how they looked when I finished them. The big picture is how they look now. More about them on my blog. 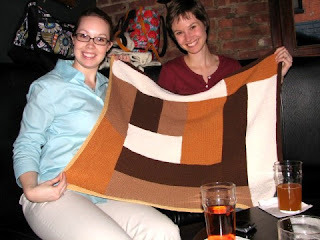 I've finished five modern baby blankets and I am sure there will be more on the way. Now, I've started with the miters. 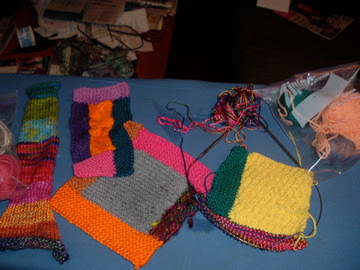 In addition, you can see some half-finished socks and a different kind of baby blanket (with a free pattern!!) at my site here. mosaic, all with a garter rib edge to keep it flat. straps and garter mosaic here.